Today, June 16th, is World Sea Turtle Day. It's a day to learn about the uniqueness of sea turtles, their conservation challenges, and to join the fight to protect them. Loggerhead Caretta caretta turtle which nests in our region of focus, KwaZulu-Natal. This is the largest of the hard-shelled turtles and can reach up to 450kg in size. Status is Vulnerable. Leatherback Dermochelys coriacea also nests in KwaZulu-Natal where it feeds on jellyfish and can dive deeper than any other turtle - reaching depths of 1.5km! Vulnerable. Green turtle Chelonia mydas. The most widely distributed of all sea turtles, nesting in 80 countries. Endangered. Hawksbill turtle Eretmochelys imbricate. This turtle is critically b. It hunts crabs and prawns with its unique curved beak which gives it its name. 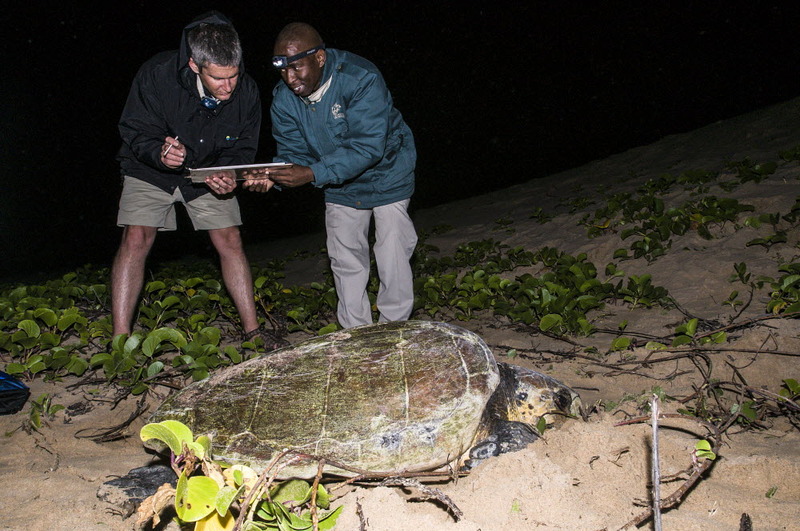 Loggerhead turtle tagging at iSimangaliso Wetland Park. Photo Credit: Peter Chadwick\WildScreen Exchange. Last year, Wild Tomorrow Fund successfully saved 1,235 acres of land, now a protected area called the Ukuwela Conservancy. One of the reasons this particular parcel of habitat was critical to protect, is its proximity to the iSimangaliso Wetland Park, a UNESCO World Heritage site. iSimangaliso is one of only a handful of marine World Heritage sites in the world that protects the beach nesting sites of sea turtles. Loggerhead and endangered leatherback turtles arrive each year between November and March to nest on the Park's 220km of shoreline. The Ukuwela Conservancy forms an important buffer of protection along the south bank of the Mzinine river, a major tributary into the False Bay section of iSimangaliso Wetland Park. By saving this land and preventing it from being slashed, burned and converted into a pineapple farm, we have prevented agricultural run-off including pesticides and other pollution from entering this precious and fragile wetland ecosystem. With the help of our volunteers, we have already removed almost 8 tonnes of illegally dumped plastic from pineapple farmers from the bank of the Mzinine river, with more to come to complete the removal of this pollution which otherwise would flow into the wetland and ultimately the ocean, impacting all kinds of marine life from crocodiles to birds and sea turtles. Plastic pollution from pineapple farming lining a section of the bank of the Mzinine river, Ukuwela conservancy South Africa. Ocean plastic pollution is one of the major threats to sea turtles, alongside poaching. It is estimated that one sea turtle out of two has ingested plastic, often mistaking it for food such as jellyfish. With 8 million tonnes of plastic dumped in our oceans every year, it is no wonder that turtles, whales, fish, birds and other marine life is choking on plastic in our oceans. Sir David Attenborough has been leading the charge to raise awareness of the dangers of ocean plastic pollution this year, with his haunting message from BBC's Blue Planet II series. "For years, we thought that the oceans were so vast that nothing we could do could have an effect upon them. It is now clear that our actions are having a significant impact on the world's oceans" said Sir Attenborough, "We are at a unique stage of history. Never before have we had such an awareness of what we are doing to the planet. And never before have we had the power to do something about that. Surely, we have a responsibility to care for our blue planet. The future of humanity, and indeed all life on earth, now depends on us." Protecting oceans means protecting major tributaries that send pollution downstream, ultimately to the sea. It means ensuring the pesticides and other toxic chemicals used in industrial farming are not washed into our river systems. And at an individual level, it means thinking every single time you use plastic and asking yourself if there is an alternative. This year, UN Environment Goodwill Ambassador, Ellie Goulding, visited Kenya to learn more about the devastating impacts of plastic pollution on sea turtles. "It's crazy, but in thirty years time there may be more plastic in the ocean than fish", said Ellie Goulding. But she remains hopeful for turtles and all marine life, "We are here and we are going to change things". 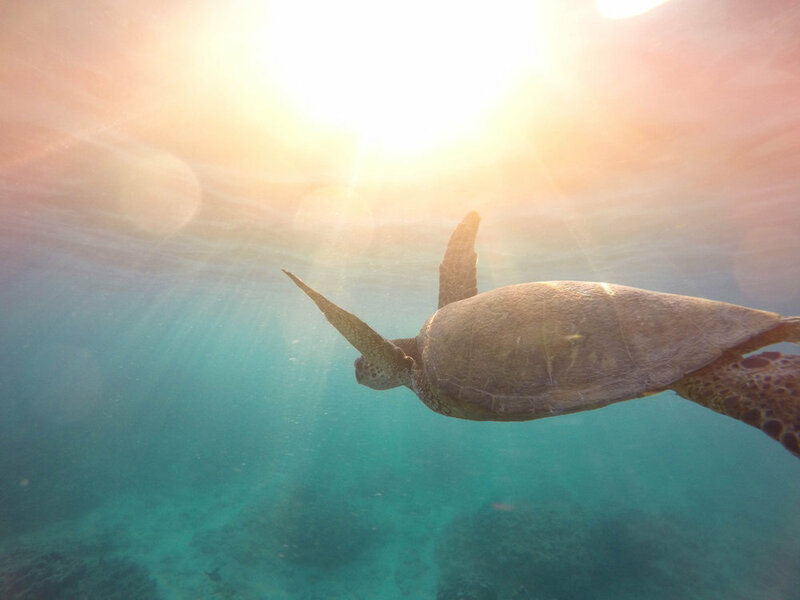 Today on World Sea Turtle Day, we urge you to reduce your personal use of plastic and to consider its impact on the planet and the stunning diversity of marine life, including sea turtles. Ellie Goulding, UN Environment Goodwill Ambassador, assisting a rehabilitated sea turtle that had ingested plastic (Kenya).